Chores – this word is present in the lives of every adult individual today and it seems that we can’t skip them and there are moments when it looks like the list of chores is so long that we will never finish them. In addition, the motivation and inspiration are often absent too. However, with the help of an interesting new product created by Chinese students, you can be physically active and do laundry at the same time. BiWa or the Bike Washing Machine is a washing machine that works on energy produced by the human body. This washing machine supports your efforts to perform multitasking and preserve water and on top of that you will get a chance to exercise! 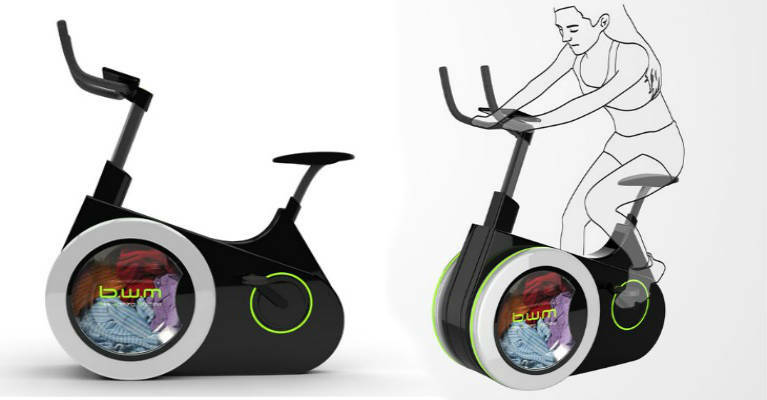 This interesting bike/washing machine, which is still not available on the market, was created by creative students at Dalian Nationalities University in China. Thanks to the pedals, users will rotate and spin the front wheel which represents a clothing drum. The additional energy that is not used for this purpose and comes from the cyclists efforts is redirected to the display screen where users can check the progress of the wash cycle. So, whenever your children or your husband feel very energetic, let them cycle because excess energy is stored and you can use it later. Most people today skip their chores and taking care of themselves by saying that they don’t have enough time. With this special product you will be able to save time and get in shape. In addition, when it comes to college students and families that are looking for ways to save money, this unique bike can save your money in the long run because you won’t have to visit the Laundromat which can be quite expensive especially when the Laundromat is located few block away.